Out of hundreds of applicants, Goldach ended up in the top three and was featured on the cover of the January issue. "Our runners-up this year were also ideal candidates, not only in our opinions, but in the opinions of those who work with them on a daily basis," said Kathy Huston, Advantages Editor. We were proud to nominate Goldach. She consistently exceeds her clients' expectations and repeatedly went above and beyond to meet their needs -- all in a year when she became pregnant with her first-born and took a three-month maternity leave to care for her baby. "My nomination came as a complete surprise," Goldach said. "I am grateful for this honor and for the support of my great co-workers and clients!" Read more about her accomplishments and sales philosophy in the Advantages article. 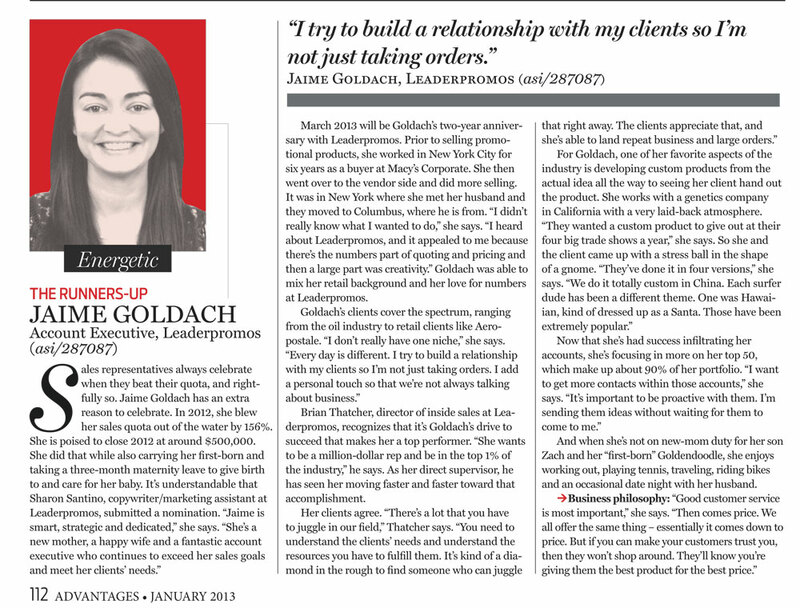 We appreciate and admire Jaime Goldach's drive to succeed! Congratulations and thank you for being a part of our team!